Welcome! I’m so glad you’re here and interested in the Breaking Up with Perfect online book study. If you’re like me (and I’m guessing you are since the title of my book caught your eye! ), you’re wary of things that are new or unfamiliar. I’m always a little afraid, worrying that I won’t know what to do or where to go. It’s my heart’s desire to make it very easy for you, so all the details are below. I know it looks like an awful lot of information, but some of it’s repeated to make sure you don’t miss a thing. Go ahead and read it all– you can do it, and I promise it will be worth it! If you have any questions left after you’ve read through, feel free to leave a comment, and I’ll answer you just as quickly as I’m able. We’re in this together! WHEN: You can start any time and work at your own pace. This is written in an easy study format, and you can complete as many or as few of the activities as you like. You can access each lesson right here. You can interact online with others around the ideas of the book. If you’d like, you can join the private Facebook page here for more interaction. This group was active in August 2016 when I did the study live, but you are welcome to join, access lots of additional resources, and comment if you’d like. Note: The giveaways are not current. You’ve got an irregular schedule because of work, kids, appointments, or other interruptions. You can do an online study on your own time–right on schedule or at your own slower pace. You’re mobility is limited, and you’re at home. This is a way to connect with other women right in your living room. This is a safe place to build relationships with others while maintaining your privacy. You can share freely without fear of judgement. Authenticity is a cornerstone of my book, and I was very vulnerable in writing this. I hope it makes you feel free to be your truest self too. 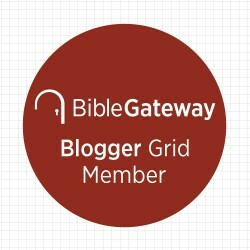 This is a super-easy way to lead a small group. The group can meet together once a week to discuss your personal take-aways, but I’ll lead the weekly assignments. If you’d like to have a Leader’s Guide with tips, videos, and a schedule for leading your group, click here to purchase it. Access to a computer or mobile device. Your Bible and a pen. A copy of Breaking Up with Perfect purchased from Proverbs 31 Ministries, Barnes & Noble, Amazon, or your favorite book seller. Digital copies are fine! Optional: If you send a copy (scan, photo, etc) of your receipt OR a photo with you holding your copy of the book to [email protected], you will receive a free printable copy of the Participant’s Guide. 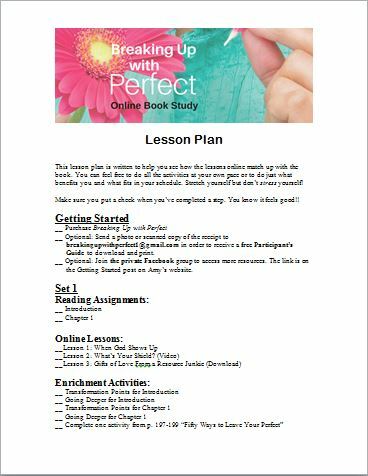 Optional: Click here to download and print a Lesson Plan that gives you a place to keep it all in order and a place to check things off as you complete them. As you’re about to find out, there’s almost nothing that I love more than a list full of check marks! If you would like to lead a small group in person along with doing the online study, please click here to purchase the Leader’s Guide. There are discussion questions for each week, links to Teaching Tips for Teachers videos, and lots of other ideas for your small group! WHAT’S INCLUDED IN THE STUDY? Each week will start with a blog post connecting my book to my powerful lessons from my last trip to India. This will be a slant on the book that you can only find here! Assignments will be at the bottom of each blog post. There will be a video for each set of lessons. These videos were originally created for a Facebook Live event, so they’re informal (read- roughly edited!) and fun. Leaders, you may want to use them with your group or simply as a resource for your own study and teaching. Fabulous extra resources will be shared here and on Facebook (click here). There’s a free download each week right here on the website (just to keep it fun! ), but make sure to join us both places. Join the private Facebook Group by clicking here. Purchase your book by clicking on your favorite book seller– Proverbs 31 Ministries, Amazon, Barnes & Noble. Optional: Download your FREE Participant’s Guide by sending a picture/copy of your receipt or of you holding your copy of the book (digital copies are just fine) to [email protected]. Optional: Click here to download and print a free Lesson Plan to remind you of where you left off and how much you’ve completed. Wow! Thank you for helping more women to join us in the journey to break up with perfect!